I've been tinkering with these scripts for the last few months as part of our game development. I've decided to make them available incase they're helpful to others using Spine. Scripts to export Adobe Photoshop and After Effects content to Esoteric Software's Spine animation tool JSON format. Plugin effects, like particles, etc. Some of these limitations are easier to work around than others. For example, if you are warping an image, consider rendering out the warping animation to a PNG sequence and using that as a layer. For particle effects, render those out as a separate PNG sequence as well. Use a lower resolution if you can to save texture space. Same goes for glows, shadows, and other effects. They can be rendered out, added as another layer, and faded in and out using opacity, often at lower resolution. There is an official photoshop export script from Esoteric Software. This one was written mainly to work with the new Photoshop CC 2013 image generator feature. psd_to_spine.jsx only exports layers that are named with ".png" in their name. It takes into account any declared scale, if there is one. For example, "25% foo.png" will use write out a PNG that is 25% of the layer size, but add "scaleX": 4.0, "scaleY": 4.0 to the Spine JSON output. psd_to_spine.jsx also exports Groups as bones, and uses relative positions for the layers within the Group/bone. Regarding duplicate or mirrored images, the workflow we've adopted is to use duplcated and/or mirrored objects all we want in Photoshop, but once we export for Spine, edit the JSON and replace all duplicate image references with a single image reference. Various texture packer or atlas generators can do this job as well. The point is, look for opportunities to re-use the same texture in Spine if possible. If you run into something that should work but doesn't, feel free to comment here or post an issue on github. Re: The AfterEffects export script. Are the keyframe curves/graphs exported correctly? Or at least approximated? That's a good question. Currently only the key frame times and values are exported, not any curve info, so they're just linear. That's definitely something I'd like to look into. Could be done by sub-sampling and adding more keys, but if it's possible to approximate using the bezier interpolation available in Spine, that'd be better - or at least cooler. I hope Nate can point you in the right direction. This is really important 'cause just for its controls, there are still some things like effects animations and 12/24fps things that are easier to animate in AE than in Spine. This would really fill in the gaps it has right now. The other gotcha is the way that Spine handles rotation keyframes. In order to make my export work, I had to add keyframes if the difference between the After Effects keyframes was greater than 180. This is fine for linear interpolation, but making an intermediate bezier control point will be trickier. Of course, all of this is a non issue if we don't mind adding a keyframe every nth of a second. Then you'd be getting really close to the After Effects animation curves at the expense of data size and edit-ability in Spine. I see what I was not understanding now. After Effects has two different interpolatable things: spatial and temporal. Spine, on the other hand, has only temporal. 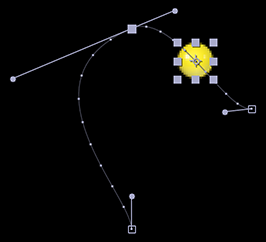 The Bezier graph in Spine let's you adjust time, not position. I think the only solution for accurate export of "position" from After Effects to "translate" in Spine is to sample and add a keyframe every frame. Since everything we've been using this script for so far does pretty well using linear spatial interpolation, I'd like to keep that functionality. Seems like this might be the first candidate for a UI for this script. One that let's you chose whether you want to add a keyframe per frame or not. It has 3 Position keyframes. When I'm processing the data for Spine, I still output a keyframe for each After Effects keyframe. But I also walk the Position values frame by frame between the keyframes. If the position ever strays from a linearly interpolated point by more than 20%, I emit another keyframe. Notice how we end up with more keyframes where the curvature between the keyframes is greatest. Still doing some tweaking and testing but the results are promising. Unfortunately, the proliferation of keyframes (even minimally) makes for a not-so-editable Spine animation. That's only an issue if you need to tweak positions in Spine after export, though. But how i can export multiple composition in After Effect as Animations in Spine?. I'm very happy to hear that you have a script for AE to Spine. I was trying to write one for my self as well. I hope we can share ideas and features to make the script better and better. The limitation is that in AE we should always make horizontal bezier control points (which I think is enough). I hope you find this useful. It's nice to meet you! Fantastic! I'll definitely have a look at that approach, and I agree that simple horizontally offset control points should be fine. This should work great for temporal easing, but curved paths that control the value itself would need to be supported in Spine. We just need to round the results to make them shorter. Very cool stuff. Yes, I know what you mean about those giant floating point numbers in JSON! I'm sure 8 places would be fine, but more accuracy isn't a bad thing either. By the way, do you have a plan to convert puppet pins in AE into mesh deform in Spine? Moreover, in AE, I see a very cool feature. It lets us transform a layer in 3D. I think it is possible to simulate that perspective look into Spine using mesh deform. How do you think? Do you have time to further develop the script? I see that your thread was not updated in the last 5 months, so I just wonder. Great questions. I've pretty much taken this script as far as it needs to go for our purposes. I have given some thought to what it would take to support "standard" deformations in many Adobe products. (See here). Puppet support would be amazing! I don't have the time to pursue it, though. The last time I approached that issue (before Spine existed) it was not possible as the mesh data was never serialized in a way that could be exported. It was a proprietary mesh-generating algorithm that only took in a few parameters. Hi Mitch. Thanks for the info. I have an idea of even simulating that algorithm and adapt it to Spine, although I know this will be difficult. Nimai, is it possible to make several animations in AE (each animation is a composition), and then export all of them to only one json file? @famevn - I assume you mean that multiple compositions would be output as one JSON file, and each composition would be it's own animation? That would be pretty useful. Each composition would have to have the exact same layers. Is that what you're thinking? I don't see any technical reason why that couldn't be done. For now, you should be able to copy-paste and consolidate animations from multiple exports into one. Do you mean I should manipulate the JSON files? I tried to copy-paste an animation like you suggested but nothing happened. Editing the JSON file is too complicated to my fellow artists. Nimai, can you help supporting this feature in your script, please? I would appreciate it very much. Hello Nimai, thank you for making the script and letting us use it. I am trying to test it, but I do get this error "unable to execute script at line 443. Not well-formed (invalid token"
On AE CC 2014. I tried to export just one png layer where I made it follow a path. No luck. Then I just tried to export two png with no key frames. Hey! I'll PM you. Maybe we can figure out what could be going wrong. Sorry I'm late to the party! These scripts are super cool, thanks for sharing them! Updated the ae_to_spine.jsx script to export "blend" (normal, additive, multiply, screen) instead of "additive". This will require use of Spine v2.1.26 or later.